Although employers need to be diligent about complying with the employment verification rules of the Immigration Reform and Control Act (IRCA), they should not be so overzealous that they end up penalizing qualified employees. IRCA has anti-discrimination rules that can result in an employer facing stiff sanctions and these rules are enforced by Immigrant and Employee Rights (IER) Section, a part of the Civil Rights Division of the Department of Justice. Employers of more than three employees are covered by IRCA anti-discrimination rules (as opposed to the 15 or more employees covered by Title VII of the Civil Rights Act). IRCA protects most U.S. citizens, permanent residents, asylees, and refugees from discrimination on the basis of national origin or citizenship status if the person is authorized to work. Aliens illegally in the United States are not protected. Under IRCA, employers may not refuse to hire someone because of his national origin or citizenship status, and they may not discharge employees on those grounds either. The employer is also barred from requesting specific documents in completing a Form I-9 and cannot refuse to accept documents that appear genuine on their face. differential treatment, and regardless of whether such treatment is because of animus or hostility. According to the IER, this regulation merely incorporates the intent requirement contained in the amended statutes and case law. It agrees that under section 1324b, a violation cannot be established under a strict liability standard or a disparate impact theory. The IER has exclusive jurisdiction to rule on “citizenship and immigration status” discrimination claims against employers with four or more employees. “Citizenship or immigration status” discrimination refers to when a person or entity discriminates against any individual (other than an unauthorized immigrant) with respect to the hiring, recruitment, or referral for a fee of the individual for employment, or the firing of the individual from employment because of the individual’s citizenship or immigration status. The IER has limited jurisdiction over “national origin” discrimination. “National origin” discrimination refers to when a person or entity discriminates against any individual (other than an unauthorized immigrant) with respect to the hiring, recruitment, or referral for a fee of the individual for employment, or the firing of the individual from employment because of the individual’s national origin. The IER’s jurisdiction in this matter is for employers with 4 to 15 employees. Improperly treating groups of applicants differently (for example, based on looking or sounding foreign) when they complete Forms I-9. All individuals authorized to be employed can file a claim under the unfair documentary practices if an employer has four or more employees. Setting different employment eligibility verification standards or requiring different documents based on national origin or citizenship status. (i.e., non–U.S. citizens forced to present U.S. Department of Homeland Security (DHS)–issued documents, like green cards). Requesting to see employment eligibility verification documents before hire and completing the Form I-9 because an employee appears foreign or the employee indicates that he or she is not a U.S. citizen. Refusing to accept a document or to hire an individual because an acceptable document has a future expiration date. Requiring an employee during re-verification to present a new unexpired Employment Authorization Document (EAD) if the employee presented an employment document during the initial verification. Limiting jobs to U.S. citizens, unless a job is limited to citizens by law or regulation. Asking to see a document with an employee’s “Alien” or “Admission number” when completing Section 1 of Form I-9. Asking a lawful permanent resident to re-verify employment eligibility because the person’s green card has expired. A “protected individual” under the anti-discrimination rules of IRCA includes anyone who is a U.S. citizen as well as individuals who fit the following categories: recent lawful permanent residents (green-card holders) - meaning individuals who have not held LPR status for no longer than six months beyond becoming eligible to naturalize; refugees; certain beneficiaries of the 1986 legalization program; and asylees. Employers are not required to consider applicants who are outside of this list under IRCA’s anti-discrimination rules. Employers should be careful, however, to be consistent in applying their policies so as to avoid a finding that a particular group has been disparately treated. Such inconsistency could lead to a finding of “national origin” discrimination under Title VII of the Civil Rights Act. 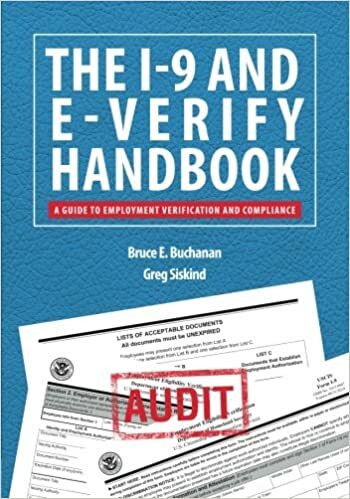 This article is taken from Chapter 7 of the book, The I-9 and E-Verify Handbook, which I co-authored with Greg Siskind, and available at http://www.amazon.com/dp/0997083379.